If you have or someone you know has a food allergy, you know how important it is to monitor what foods are consumed. From specific foods to food labels, it’s imperative to make sure you do not eat a foodstuff that will trigger an abnormal physiological response to your body. When the body responds to a food allergy, symptoms generally happen within a few minutes to several hours after exposure to the allergin, and the following responses may take place: GI symptoms, such as abdominal cramps, diarrhea or vomiting; hives; itching in the mouth and/or swelling of lips and tongue; and/or tightening of the throat or trouble breathing. If a severe allergic reaction takes place—known as anaphylaxis—then other parts of your body may be affected. Symptoms from a severe allergic reaction may include chest pain, coughing, shortness of breath, tightness, and wheezing; cramps, diarrhea, and vomiting; passing out, shock, and weak pulse; itching in the mouth and/or swelling of lips or tongue; dizziness or fainting; runny nose, sneezing, stuffy nose; hives, itching, redness, and swelling; difficulty swallowing, hoarseness, itching, and tightness of the throat. Anaphylaxis can be very dangerous, and if you or someone you know experiences any of these symptoms you or they must be evaluated by a healthcare professional. Although food allergy is the major cause of anaphylaxis, other things may cause an anaphylaxis reaction, such as medications, insect bites and stings, and latex. 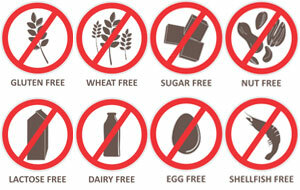 Common food allergies vary from infants and children to adults. Typical food allergies in infants and children include egg, milk, peanut, tree nuts, and/or wheat. Common food allergies in adults include fish, peanut, shellfish, and/or tree nuts. Food allergies can develop at any age and must be diagnosed by a healthcare professional in order to find out whether symptoms are caused by an allergy to a specific food, a food intolerance, or other health problems. There is no cure for food allergies, so preventative measures must be taken. It is also imperative to read food labels as many foods are ingredients in prepared dishes. Other ways to help in case of an allergic reaction include wearing a medical alert bracelet, carrying an auto-injector device containing epinephrine, and immediately seeking medical help if a severe allergic reaction takes place.